A 2-day Lincoln Highway course is being offered in this fall by the Continuing Education division at HACC-Gettysburg Campus. “Lincoln Highway: Past and Present” will run Wednesday, Sept. 28, 6-9 pm, and Saturday, Oct. 2, 8 am–6 pm. Cost is $65 and deadline to register is Sept. 22. For 200 years, Americans had been fascinated by the thought of practical, coast-to-coast travel. The first successful attempt was the Lincoln Highway, a patchwork of trails, roads, and main streets, which would have a dramatic impact on this country. Students will examine the history, development and decline of the highway and its impact on everyday life. 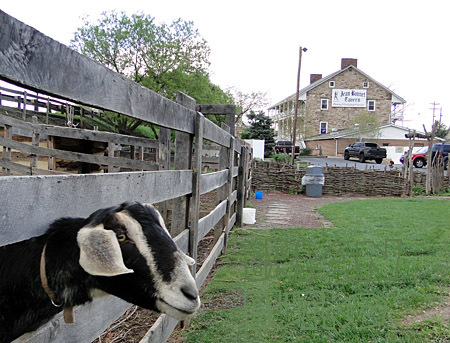 The class includes a field trip along the Lincoln Highway as far east as Coatesville. For more information, call the continuing education office at HACC-Gettysburg Campus at 717-338-1010 or visit www.hacc.edu/. James Devitt Jr., who goes by the name Lincolnhighwayman (in the tradition of a 1917 play and 1919 film), is traveling the Lincoln Highway this summer. He hopes to turn the journey into a book that “will be a mixture of popular history and an old fashioned traveler’s tale … like Shelby Foote meets Mark Twain.” James is already the author of The Malone Chronicles, a novel set in 1939 about a boy who runs away from home. Follow the current trip at blog.lincolnhighwayman.com/. Here’s a video of his Ford Model A touring the battlefields at Gettysburg, Pa. The Lincoln Highway Heritage Corridor is sponsoring a one-day bus trip along the Lincoln Highway from Schellsburg to Gettysburg and back on June 26. Departure from Shawnee State Park will be 8:30 am, return by 8 pm. 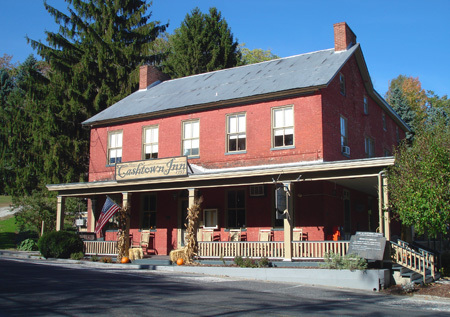 Jean Bonnet Tavern along the Lincoln Highway west of Bedford. The deluxe motor coach trip will be narrated by Dr. Fred Gantz, an adjunct faculty member at several area colleges who knows the route well and will share little-known facts about the country’s first coast-to-coast route. 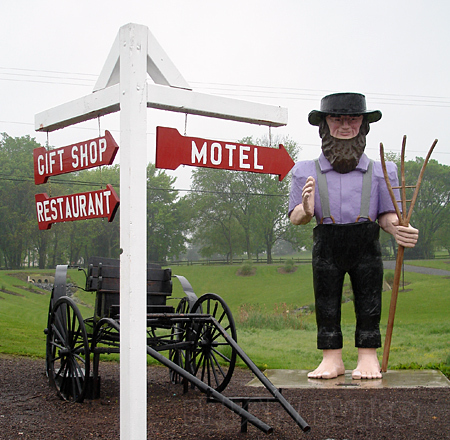 In addition to photo opportunities at two roadside giants and five Lincoln Highway murals, bus guests will be treated to a lunch buffet at the 1815 Inn at Herr Ridge, where the Battle of Gettysburg began in the fields around the inn. The tour will then catch Neil Simon’s “45 Seconds from Broadway” matinee at the Totem Pole Playhouse. This is not community theater, but live professional theater. Dinner in historic McConnellsburg. Cost for meals, transportation, show, and lots of LH history is $110. For information or reservations visit www.LHHC.org or call 724-238-9030. Route 30: Three Stories, One Highway, a film written, produced, and directed by John Putch, will be shown in Ligonier, Pa., this weekend at the Ligonier Theater, 210 W. Main St. Times are 7:30 p.m. Friday and Saturday, and 2:30 p.m. Sunday. 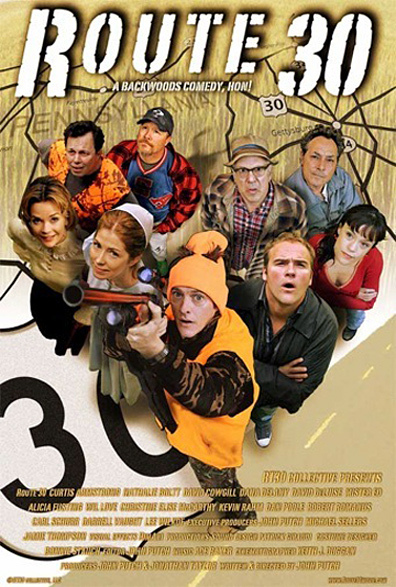 Route 30 features three interconnecting comedic stories. The cast of 15 includes TV stars Dana Delaney, Dave Delouise, and Ed Gotwalt of Mister Ed’s Elephant Museum (below, in his own poster pose). The film was shot in October 2007 between Chambersburg and Gettysburg, mostly along the Lincoln Highway/US 30. Putch is the son of Bill Putch and Jean Stapleton, best known as Edith Bunker of All in the Family. The two founded Totem Pole Playhouse along US 30 in Caledonia State Park, between Chambersburg and Gettysburg, and so is where Putch spent his youth. Mister Ed was a regular performer there too. For more info call (724) 238-6514 or visit www.Route30movie.com. It will also be shown in Connecticut at the Kent Film Festival on Friday, March 27. Above: Looking west on the Lincoln Highway east of Gettysburg, Pennsylvania, early 1970s. The images are both amazing and invaluable to roadside fans, but also a reminder that the past was not nearly as tidy as we like to remember, or recreate, it.